The paper describes the use of thermal camera and IR night vision system for the detection of Pedestrians and objects that may cause an accident at night time. As per the survey, most of the cause of the accident is due to low vision ability of human at night time, which leads to most dangerous and higher number of accidents at night with respect to daytime. This system includes the IR night vision camera which detects the object with the help of IR LED and photodiode pair, this camera has the capability to detect the object up to 100m. The thermal camera detects the heat generated by any of the objects like cars, Human animals etc. which gives us the facility to detect the object for higher range and with the low reflective surface where IR night vision may fail. With the use of these two cameras mounted on the car which helps the driver to drive safely. In this system, HOG (Histogram of orientated gradients) algorithm and support vector machine (SVM) is performed with the help of OpenCV in Matlab and EmguCV in Visual Basic 2012. The system is tested on the video recorded using these cameras and got a good and efficient result. And this system is cost-efficient and easy to implement. Thermal and IR Night vision, OpenCV, Video Processing, Object and Human Detection, Automobile Safty. Humans are the most intelligent creatures of god. Human’s one of the most important discover is transportation systems. But with the increase in population, needs and desires of human being road transportation is getting bit one of the major reasons for human-made death. Pedestrian Detection system is now requirement in the new era of transport. Is ancient time we use to travel by bullock cart or on a horse which does not causes any causality. But now-a-days people have 2-3 vehicles at their house which increases the traffic at roads and accidents and eventually deaths cause by it. In this system, we have tried to reduce the rate of accidents by more than a half. This project help to build a good and efficient and cost affective system for car/ automobile manufacturers to develop more safe and luxuries vehicles. As the population and needs of human being is increasing the numbers are increasing government is trying to decrease the rate of causality and death. In recent years, According to survey 38% of fatal accidents in the European Union occur in darkness places, instead the fact that, the traffic during nights time is several times smaller than that on a day. This means that the risk of an accident in darkness increased. This stats has a strong relation and effect on the pedestrians. Currently, the pedestrians are of about 20 % of all traffic accidents. More than half of pedestrian deaths take place at night (51 %). 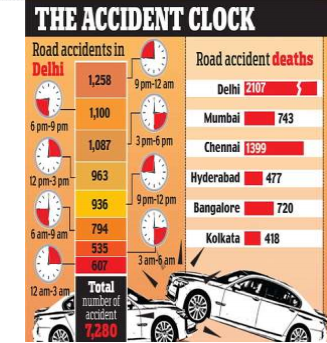 As per survey by The Times of India, in various major city of India (figure 1),we can see that 60% of accident occur at Delhi is at night time. So it is more necessary to find a good solution for reducing the numbers.